Coverage of the 2016 legislative session focused on a small number of high profile issues, but all the while here at South Carolina Appleseed we were working on several lesser known but very important bills which were enacted into law. These laws are not only great public policy; they will also help the communities we serve. We are proud of our work to ensure they passed during the session. First, Sen. Paul Thurmond’s S. 255, known as the “Mugshot Extortion Bill” was signed into law by Governor Haley on February 16th. This new law has two important sections that impact people in South Carolina. First, the law limits the ability of businesses who publish mugshots and booking information to charge a fee before removing the mugshots and booking information even after the underlying criminal charges are dismissed. This fee – often hundreds of dollars – victimized individuals who were never convicted of a crime if they did not pay to have their mugshot and booking information removed, making this change a significant step forward. S. 255 also expands opportunities for expungement of criminal records in previously ineligible circumstances. Specifically, it provides expungement relief to include individuals with convictions for wildlife offenses, dismissed driving charges and dismissed charges where a person was not fingerprinted when charged with a ticketed crime. This provision will protect consumers and enable individuals to move forward in their lives without the lingering consequences of an arrest. Another example is H. 3325, which addresses the issue of heirs’ property preservation. Introduced by Rep. James Smith and amended in the Senate by Sen. Gerald Malloy, H. 3325 was renamed the the “Clementa C. Pinckney Uniform Partition of Heirs’ Property Preservation Act”, in acknowledgement of the late Sen. Pinckney’s significant work on this issue. Heirs’ property mostly involves rural land owned primarily by African Americans who either purchased or were deeded land after the Civil War. Owners were routinely denied access to the legal system, could not afford to pay for legal services, and often didn’t understand or, for good reason, trust the legal system. As a result, much of this land was passed down through generations without the benefit of a written Will, or, if a Will was present, it was often deemed invalid because it was not probated within the 10 years required by SC law – so the land became “heirs’ property”. This statute enacts South Carolina’s version of the Uniform Heirs Property Protection Act, which provides protection for the first time to family heirs who need to go through the partition process to ensure they and their future generations maintain control over their property. Last, but certainly not least, is the “Raise the Age” legislation (S. 916) introduced by Sen. Gerald Malloy, who worked diligently to make 2016 the “year of the child”. This law will keep most juveniles accused of a crime in Family Court until age 18, rather than treating them as adults. Research shows that treating children as adults jeopardizes public safety and significantly increases their likelihood of reoffending. Due to the significant impact on the courts, Department of Juvenile Justice, law enforcement, public defenders and solicitors, the change will go into effect in July 2019, giving time for the necessary systems to be created for this change. This is a huge victory for juvenile justice in our state! We are equally pleased with legislation that we helped prevent from passing. One example is S. 997, which would have made a refugee’s sponsor criminally liable for any violent crimes or act of terrorism committed by the refugee. This liability more than likely would have impacted churches, faith communities, social service agencies and volunteers who work to help refugees resettle and assimilate. Despite its stated intent, the bill would not have advanced public safety – instead it would have alienated a vulnerable population, who undergo an extensive 18 to 24 month vetting process overseas before being resettled in the US, by discouraging groups and individuals from helping them. While it passed the Senate we thank Rep. James Smith for ensuring it did not get through the House of Representatives. 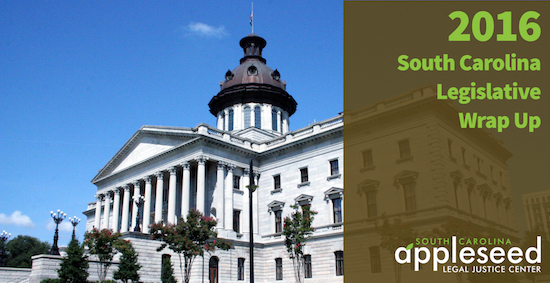 While some important issues did not make it to the finish line in 2016, SC Appleseed thanks all of our legislative leaders for these and many other positive changes that will be taking place as a result of their work. Likewise, we want to thank those who took a stand and kept harmful legislation from moving forward. Our thanks also extends to the countless individuals and organizations we work alongside to help improve our state. We could not do this work without you. There is always so much work to do, but we know that together we can make South Carolina the state we all want it to be – a state that cares for all of our neighbors equally, with no distinction based on economic status, race, nationality or gender. That’s a wrap for the 2016 legislative session!